The recovery is here! Or is it? 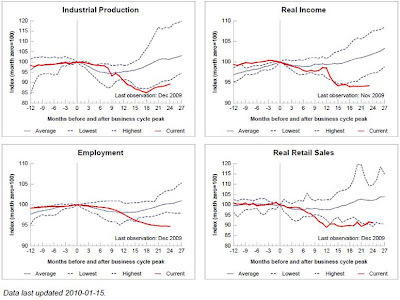 Real recovery or statistical recovery? US growth accelerated during 4th quarter expanding at a 5.7% yearly rate over the previous quarter, its fastest pace since the third quarter of 2003, when the economy grew at a rate of 6.9 %. This was a rather pleasant surprise. Sounds nice, but looking at more closely at the numbers, all is not so nice: the evil is in the details. 3.7% of the growth came from inventory rebuilding vs. 0.7% during the third quarter. Inventories grew for two main reasons: (1) restocking ahead of the holiday season and (2) inventories were below sales after the sharp adjustment of Q4 08 and the first 9 months of 2009. It has to be seen whether next quarters will see a continuing and significant rebuilding of inventories; since I am skeptical about a substantial improvement in employment numbers next year, and therefore consumption, I am doubtful and this will weigh on GDP growth. Consumer spending, which comprises about 70% of the economy, rose at an annualized pace of 2% in the fourth quarter, after an increase of 2.8% in the third quarter: better than I feared but not great and too low to inspire confidence for companies to increase inventories and hire again. 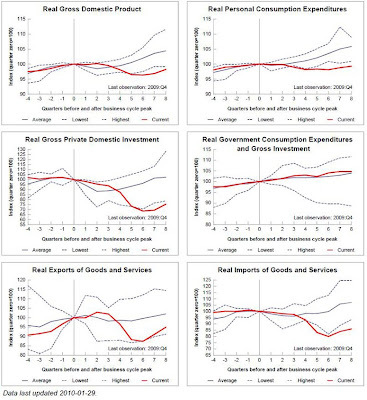 These graphs show hat the US economy (and Europe is hardly different) grew out of Government spending during most of the year (cash for clunkers and other stimulus measures) and more recently from exports. The private sector remains mostly idle however, and without it you will not have any sound and sustainable recovery. On the employment front, the economy lost 208,000 nonfarm payroll jobs last quarter, and the unemployment rate is well entrenched in the double digit number (from 10% to 17% depending of the scope of the calculation for the unemployment rate). As long as the labor market remains weak, consumers will be reluctant to spend money. 2. So, recovery or not? Retail sales during the Christmas season were not good and remain alongside the lowest limit of the band. Imports fell during the 4th quarter which (1) added to the GDP (imports are deducted from GDP) and (2) is inconsistent with an inventory- rebuilding cycle. Domestic demand slowed to a 1.7% annual rate during Q4 09 vs. 2.3% during Q3, when stripping out inventories and the foreign trade sector. The GDP data are the first estimates (advance report) and will be reviewed once for each of the two coming months. Q3 figures were eventually revised down to 2.2% from 3.5%; the largest surprise came from domestic demand revised down to 2.3% from 2.7%. In addition, banks are still not lending (we are not far from the -20% mark compared the peak reached in 2008), in particular to small and mid-size companies, the ones that usually create jobs. The same is true in Europe, according to the ECB's quarterly bank lending survey as reported by the Wall Street Journal. The Government stimulus did its job to stabilize the financial and economic situation, but there is no sign of significant recovery in the job market which will be key. In the current environment, I do not see how the economy can grow above 1.5-2.5% without a new stimulus package (that would be disastrous for the $ and interest rates and the US long term with budget deficits and debt ballooning), since the US economy is domestic demand driven (70% of GDP). And it will take many years for exports to significantly replace domestic demand as a share of the economy. This does not mean Armageddon for the stock markets given that the FED will remain accommodative. Since July, my view has been that equity markets were going ahead of themselves and a correction was due. It is my opinion that we have entered this phase and we will witness a couple months of downward pressure, providing great opportunities to get back into the market. I will carefully watch new economic releases and charts to lead me in my investment decisions. A lot of controversy is surrounding the $62.1 billion handover to bank counterparties to close out trades on credit default swaps (CDO) and collateralized debt obligations (CDO) at 100 cents on the dollar made before and after AIG was rescued . Professor Linus Wilson of the University of Louisiana has put together this helpful chart showing exactly how the bailout went down, complete with which banks got how much, published in Clusterstock. From this analysis, the US taxpayer is $30 billion down and SocGen is the winner of the contest followed by Goldman Sachs, $2.5 billion behind. For the controversy, please refer links posted in the "Source" section. Before regulating more, policy makers should focus on transparency. 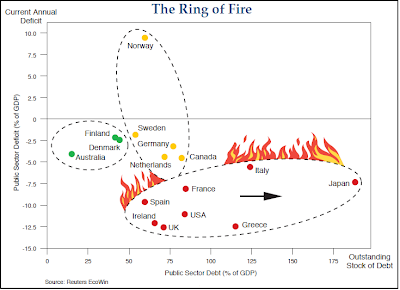 Bill Gross is always providing interesting readings. In the PIMCO February issue, Bill discusses the deleveraging we are witnessing and its consequences for a number of countries going forward. Germany will get out this crisis as the only real powerhouse in the EU, pending bailout of Club Med countries (Spain, Portugal, Greece and to some extent Italy). Lehman Liquidator Wins Court Approval to Spend $1.4 Billion to Buy Loans! I love this one. I did not see this Boomberg article reproduced or commented anywhere. “The more money Marsal brings in to Lehman’s bankrupt estate, the more its creditors can recover -- and the more his New York-based restructuring firm will make in bonuses. The firm’s contract with Lehman entitles it to a bonus of 0.175 percent of all amounts above $15 billion recovered for unsecured creditors. That’s capped at 25 percent of the fees A&M gets for dismantling Lehman, according to court documents. Based on fees collected so far, the bonus cap would be $50 million." And you bet, A&M is going to buy discounted loans for a $3.5 billion face value. If the market goes the right way, A&M will pocket up to $50 million bonus. If they are wrong, they will still get their fixed fees (already got $200 million) and creditors, who cares? What an irony: a liquidator speculates with assets belonging to creditors, from a bankruptcy originating from the same ill-conceived bonus system that brought down the system to near collapse (Don’t misread me, I am totally for bonuses, but on realized profits, not notional ones)! Change the remuneration formula: if your speculative actions go wrong, up to 75% of your fees will not be paid; believe me, A&M will not take the risk. Friday, I commented on non-farm payrolls weak numbers. Today, I am providing several charts from various sources that put these in perspective together with additional comments. the number of jobs at the end of a decade has been anywhere from 20% to 38% greater than 10 years prior. This sub-par job growth is particularly noteworthy due to the fact that the US population has increased by 10% in addition to a significant increase in global wealth during the same time frame. This recession is the worst recession since WWII in percentage terms, and 2nd worst in terms of the unemployment rate (only early '80s recession with a peak of 10.8 percent was worse). 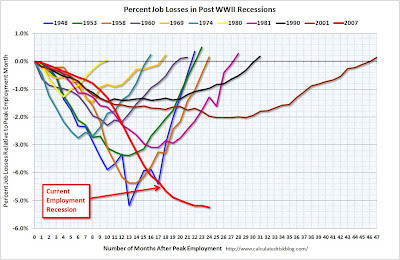 We are lower as the 1948 recession but will recover like the 2001 recession i.e. very lengthy recovery. This graph jut shows the gross figures. It is evident that the pace of job shedding is abating, but does not point towards a fast recovery in the employment situation. Unemployed are having more difficulties to find a job. It is important for this number to decrease since then next step is for unemployed to no longer looking for a job. The decline has been particularly sharp.The US finished the decade at 130.9 million, practically unchanged from the start of the decade. Meanwhile, the total pool of available labour rose from 146 million to 159 million. 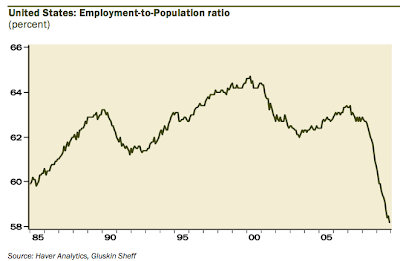 Therefore we have 13 million more people competing for the same number of job than in 2000. 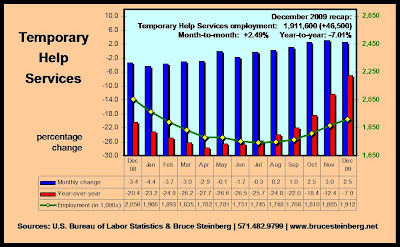 This is a positive signal since temporary jobs is a leading indicator on the unemployment situation. December was the 5th positive number in a row. No doubt that we are seeing modestly positive growth in the economy and that the pace of job declines is moderating. This however has been the result of an unprecedented public sector intervention. The private sector is still idle despite the magnitude of a fiscal and monetary stimulus of of historical proportion. The leaves me worried about the macro-economic outlook since the extraordinary measures taken in 2008-2009 cannot be repeated if the private sector does not roll again. Change in nonfarm payroll came in worse than expected at -85,000 jobs vs. a consensus of a flat number (range +40.000/-50.000). Revisions showed payrolls increased the prior month for the first time in almost two years at +4.000 and decrease 127,000 in October. Both the number of unemployed persons, at 15.3 million, and the unemployment rate, at 10%, remained unchanged. If we add unemployed persons to workers marginally attached to the labor force, we reach an unemployment number close to 12% I we add the involuntary part-time workers, we are at 17.5% (100% ratio) or 14.5% (50% ratio). This is on the back of December retail sales that look better than anticipated (+2.8% compared to a year ago according to ISCS sales index). With no improvement in the jobless numbers during the 3-6 coming months, having a negative effect on 1) would be consumers sentiment and 2) disposable income, there is a real risk that annualized growth recedes in 2010. What’s in it for 2010? Where were we in 2009? After a disastrous 2008 that witnessed a global financial and economic meltdown not seen since the 1929 crisis, the trough was finally reached on 9 March 2010 in the West (China bottomed out late 2008) with an additional 35% decline in the US stock market from 1 January when the market finally realized that Armageddon will not concretized with central banks all around the world reflating the economic activity to unprecedented levels in history. Fiscal policies added to the glut of liquidities created by central banks that found their way into risky assets, since deposit returned next to zero. Unsurprisingly, emerging markets stubbornly outperformed developed ones, reflecting higher economic growth, less affected financial systems and much higher saving rates. Whilst inflation fell, deflation did not spread. Yield curves steepened and spreads narrowed significantly, many back to pre-crisis levels (particularly TED and OIS indicating a return to normal conditions in the inter-banking market). Volatility in equity markets decreased as the year passed, with financial and information technology stocks the outright performers together with low-quality securities that were on fire-sale during the nadir of the financial crisis. 1. 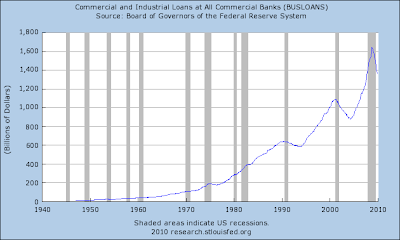 Banks’ balance sheets are still weak and they are not lending to the real economy. The private sector has not taken over the public spending. 2. 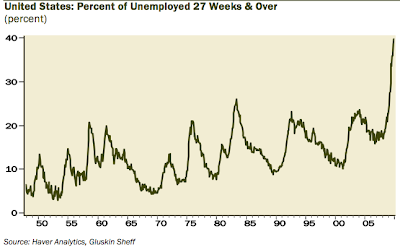 Unemployment is high and should move higher during Q1 and probably Q2 2010; even if growth increases as many suggest, unemployment will remain high. 3. Commercial real estate and credit cards delinquencies are still increasing; residential real estate is still very weak and look to be at a standstill in the US (the refinancing of many a couple of hundreds of billion dollars in 2010 will have to be closely monitored); all measures taken have postponed the purge, not solved the problem. 4. The huge deficits and additional debts accumulated by western countries will not be able to re-engineer a second stimulus package if the private sector remains idle. The reduction of public debt and budget deficits will need to be addressed. 5. Over the past years consumption and therefore economic growth, particularly in the US, was build on over-indebtedness: the deleveraging has not ended yet and what model, if any, will replace it? 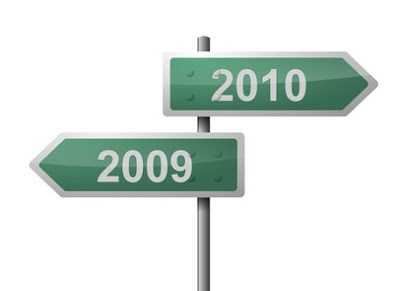 So, what are my 2010 predictions? 1. Western economies will have a positive growth, below average (currently 2.2% vs 7.3% during a recovery phase), and will significantly underperform developing economies. 2. 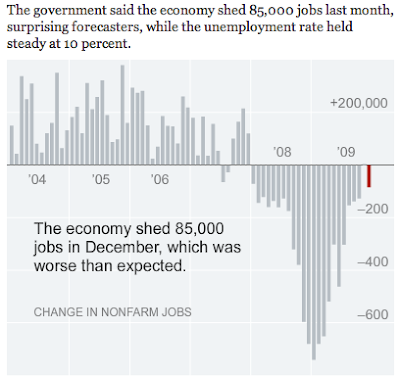 Job growth will start to show up in H2 2010, but moderately and well below what we were used to during a recovery phase. 3. Inflation will not yet be a major worry. 4. Gold and precious metals after a consolidating period will forge ahead but will not run away until inflation becomes a real worry and / or there are political troubles in sensitive countries/regions (mainly the Middle East and Afghanistan/Pakistan/India). 5. Interest rates will rise, making fixed interest rate securities a bad investment. Buyer of Western debt will need and want a higher return for a higher risk since I do not expect Western Government seriously tackling the deficit and debt problem hoping growth will do the job. 6. Selective equities will outperform cash and fixed income securities. 7. Energy, commodities (including agriculture), information technology and healthcare will outperform. Retail will also outperform if consumers go back shopping (which I dot expect in significant terms). 8. M&A activity will jump. 9. China will continue to assert its emerging superpower status and conflicts with the US will be more numerous and acute (the question is who has the most annoyance power – my guess is China at this juncture; just see the Copenhagen summit on the environment). This will be particularly true in securing access to commodities and energy sources. To conclude, I expect the start of 2010 to be fine, then to deteriorate quite rapidly (2-3 month) with a correction of 20-25% in equity markets and then partially recover in H2 2010 if there is no economic policy mistake or no unexpected external shock. Right now, and according to David Rosenberg from Gluskin Sheff, the current S&P 500 level discounts a 5% growth for 2010, which is way over the top. In any case, I do not expect a great year for equities as a whole: if the economy improves, markets will fear interest rate tightening and otherwise will discount a worsening situation. I would be short financials and long technology, commodities/energy and pharmaceuticals.